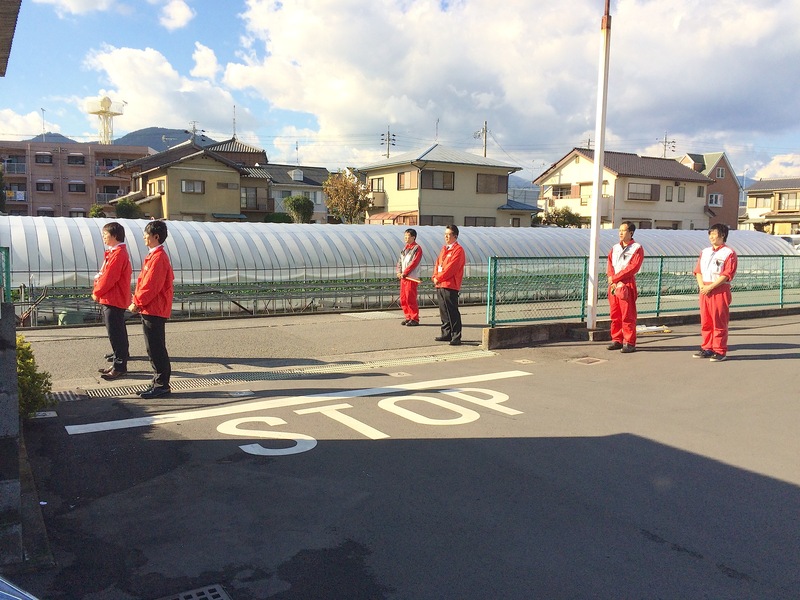 Japan is a country that takes pride in “omotenashi” or customer service. Enter a shop and you’re greeted with “irasshaimasei” which means, “welcome to our store.” Bowing or “ojigi” is practiced throughout society as a greeting, to say goodbye or to apologize. 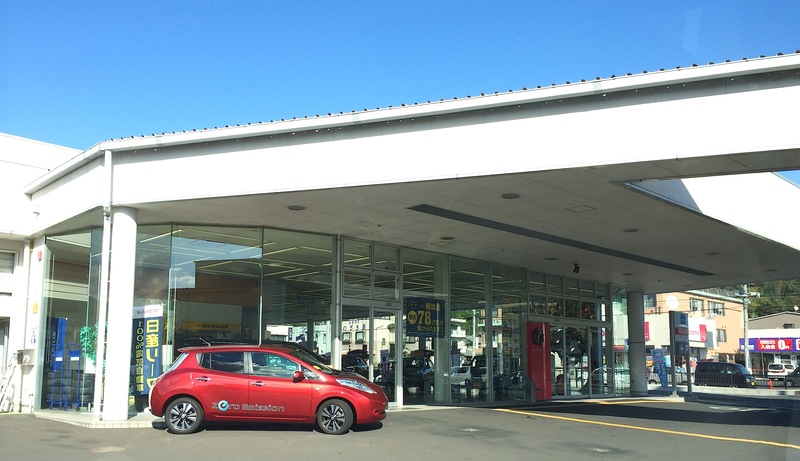 Join us as we visit a Nissan dealership in Japan to witness omotenashi in action and see how they take extraordinary measures to satisfy customers. A wise man once said that the best way to get to know a country is to stay with its people. 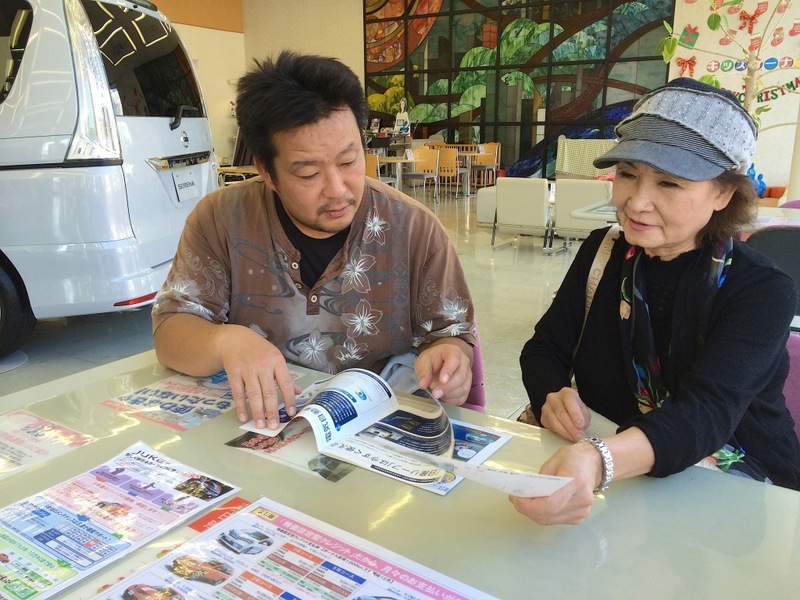 So rather than just selecting a dealer at random, we accompanied our Japanese relatives to their favorite Nissan dealer. 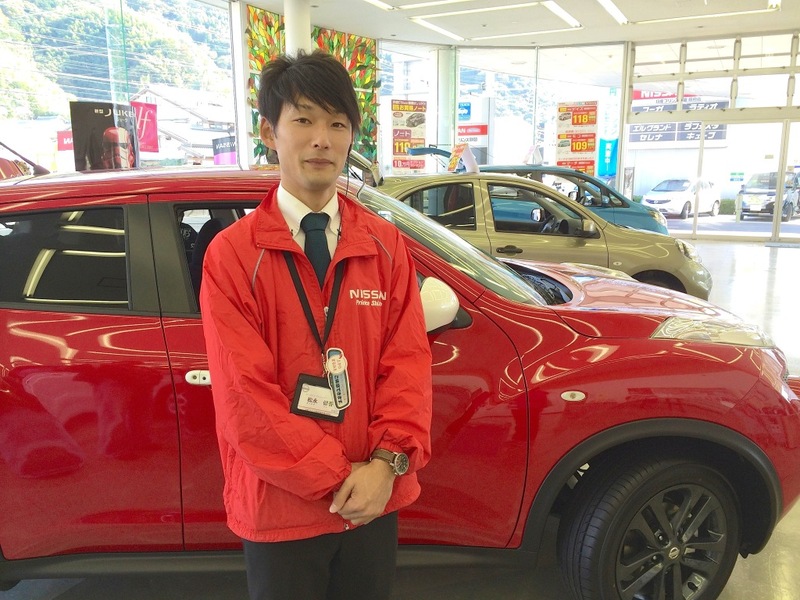 Our sister, Akemi, has purchased several cars at Nissan Prince Shizuoka. Located about 100 miles southeast of Tokyo, Shizuoka Prefecture is the home of Japan’s famous landmark Mount Fuji. “Prince” has a significant meaning in the dealer’s name. Price Motor Company built Skyline and other models prior to merging with Nissan in 1966. Skyline has been in production since 1957, first as a four-door sedan, and later as a sporty coupe with highly collectible versions including the GT-X and GT-R. Today’s Nissan Skyline is called Infiniti Q50 in America while GT-R is Nissan’s flagship sports car. What drove Akemi to this dealership is their reputation for customer satisfaction before and after the sale. With her kids grown and out of the house, Akemi wanted to downsize from a van to a smaller and more economical car. 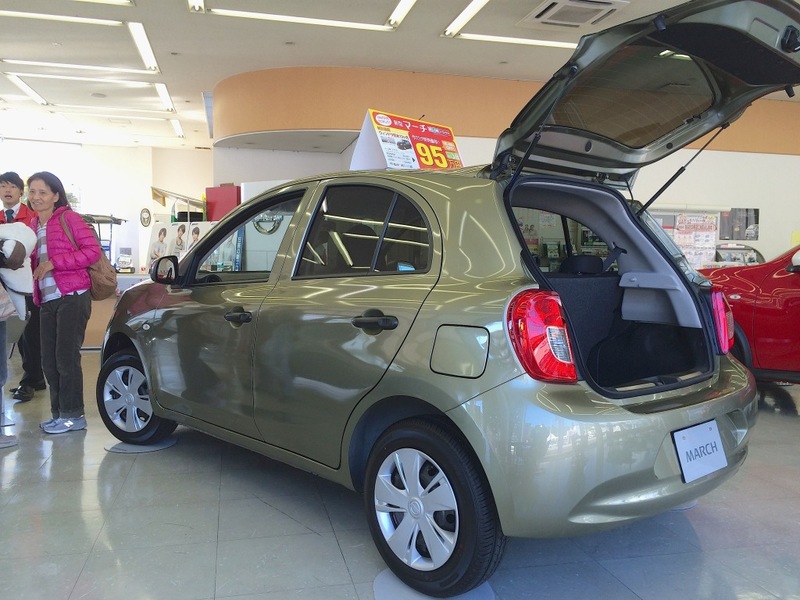 After looking at several choices, she selected Nissan’s Moco, a five-door liftback in Japan’s “Kei-car” class. These cars are limited to engines displacing no more than 660 cc, enjoy lower tax rates than larger vehicles and are fuel-efficient and easy to park. On the outside, the dealership looks similar to American counterparts, with a showroom, service and parts departments and new and used cars on display. Yet as we walk through the showroom doors we quickly realize that this is a different world. We’re greeted with “irasshaimasei,” and a bow from Akemi’s sales consultant, Kengo Matsunaga, Car Life Advisor. Akemi introduces us as her relatives and Matsunaga invites us to be seated at a table. He asks if we would like refreshments and takes our order. A few minutes later, he returns with a tray and serves us juice, tea and cookies. While we’re eating, I ask if they have a Skyline at the dealership. The answer is no, however he presents a glossy Skyline brochure for us to review. Nissan’s lineup in Japan is vast, with 40 models of cars, EVs, vans, SUVs, trucks and commercial vehicles to select. It’s impossible for one dealer to stock all of these vehicles so high-quality brochures are available for review. Despite its reputation as a nation that embraces high technology, printed materials are still plentiful. While it’s tough to find them in America, Japanese bookstores are everywhere and we even spotted record stores too. We asked if we could examine the vehicles in the showroom. 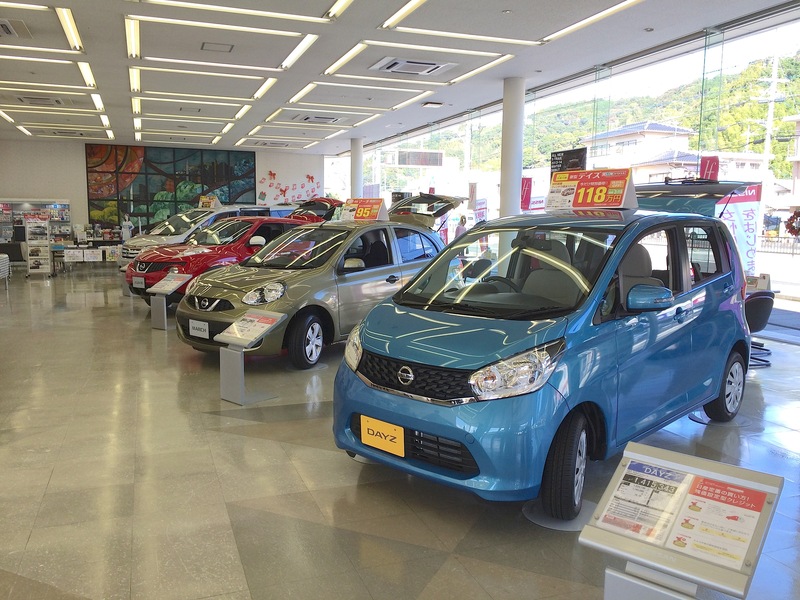 Those on display included the Serena minivan, Juke, March subcompact and DAYZ, a popular Kei-class car. While we would love to bring home a Japanese market car, these right-hand-drive models can’t be imported into the U.S. However, there’s no limit to the imagination when it comes to reporting fresh ideas and new ways of thinking. We mentioned that we would not be buying a car that day, so Matsunaga directed us to a “Lottery” table and invited us to play. We turned the wheel on a small drum and a color-coded ball emerged. Our prize was two bottles of tea, which he placed in a bag and presented to us. Other prizes included gift packs of food and confections. While these services convey a friendly, relaxed and fun atmosphere for car shoppers and their kids, they’re also offered as after-the-sale support. Akemi mentioned one of the reasons she frequently returns to the dealer is for a free car wash – anytime as long as she owns her car. 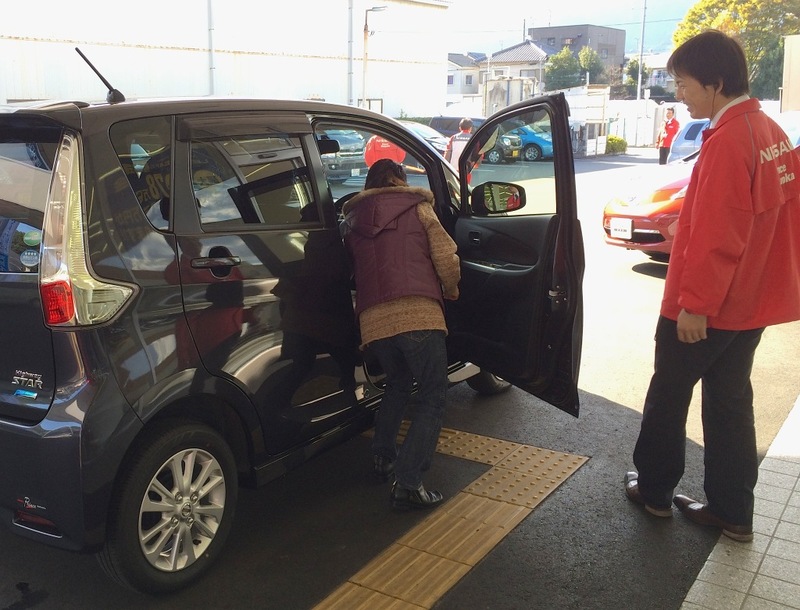 An attendant drives her Moco to the on-site automated car wash while she enjoys refreshments, watches TV or plays games with her grandchildren. 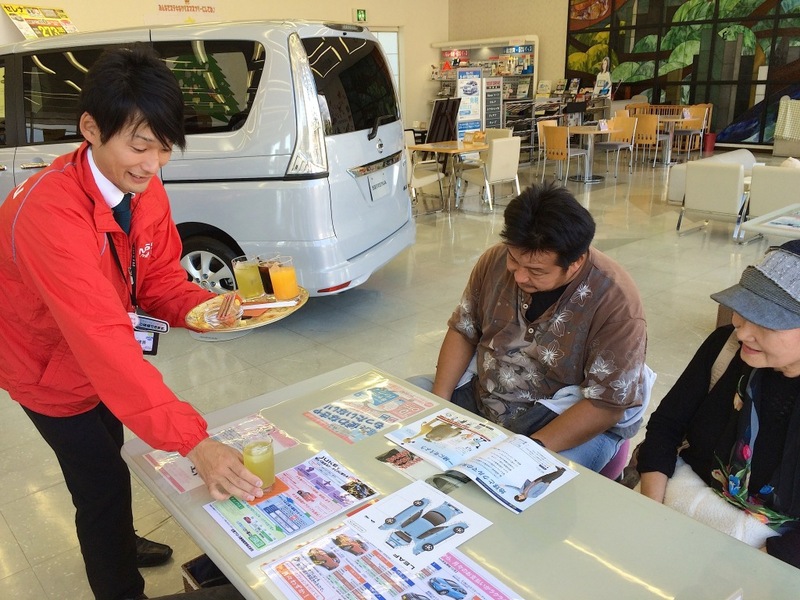 Matsunaga excused himself and mentioned he needed to step away for a few minutes while dealership staff performed a new-car delivery. We were invited to watch from the sidelines. 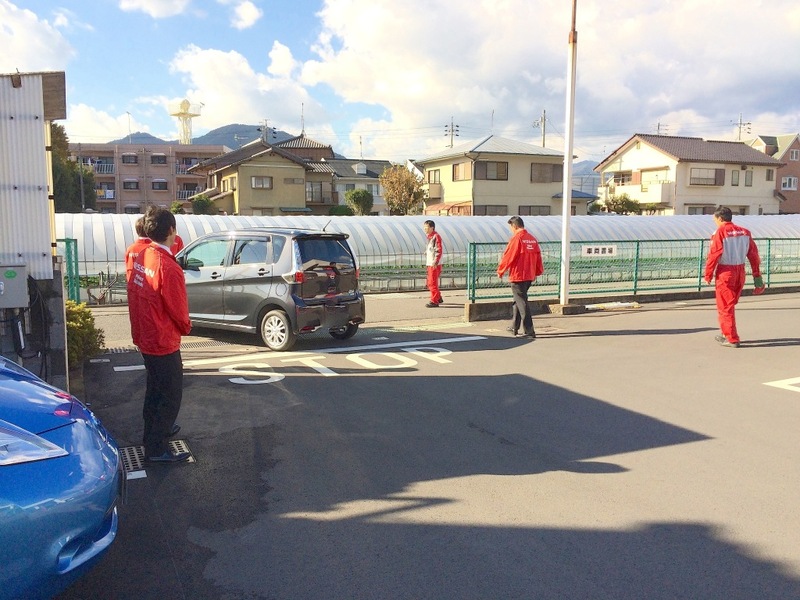 A woman was taking delivery of her new Nissan DAYZ when staff from every department in the dealership walked up to congratulate her. 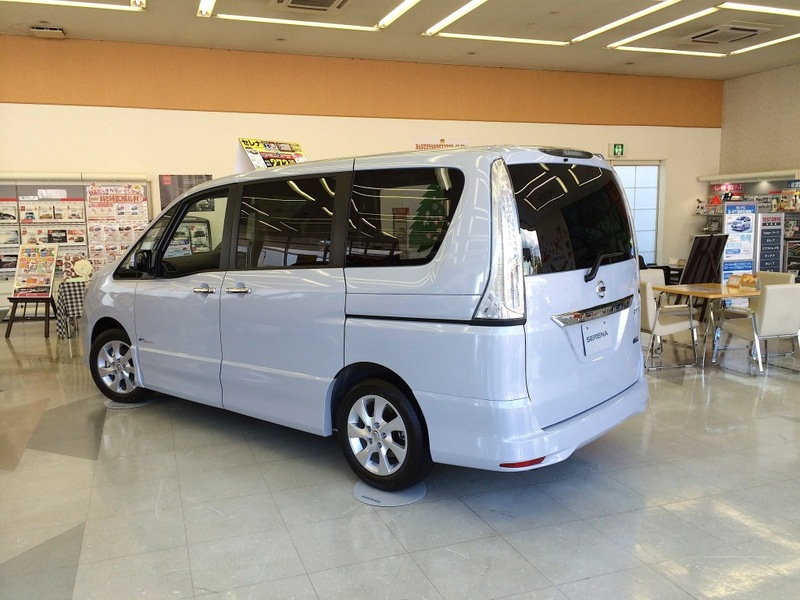 They cheered, applauded and welcomed her to the Nissan-Prince Shizuoka family. We smiled as she thanked them and got into her car to drive home. Yet that’s not the end of this story. Our jaws dropped as they escorted her to the street behind the dealership, stopped traffic and bowed in unison as she drove away. While our departure was less ceremonial, we were invited to look at a LEAF outside the showroom. The dealer offers a charging station where owners can recharge their batteries while customers can take a break and do the same in the showroom. Just like in America, selling cars takes patience, practice and professionalism. 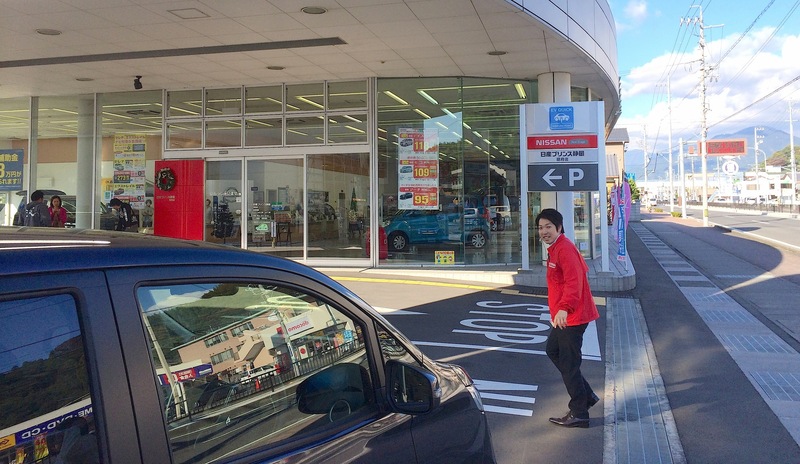 Japanese are willing to go the extra mile (kilometer) to make a sale and support their customers long after the new-car smell wears off. If free car washes make customers for life, then this dealership’s investment in facilities and utilities is money well spent. Japanese society with its meticulous devotion to “omotenashi” amazes us. From the Bullet Train conductor bowing as he checks our tickets, to the sushi bar waitress providing slippers when we take off our shoes, to the car salesperson who offers us tea and cookies, we’re filled with happy memories and look forward to our next trip to Japan.